When people think of road trips, they often think of huge countries like the USA or Australia. Places like the Icelandic Ring Road and South Africa’s Garden Route are also popular for self-diving trips. There’s once awesome road trip in Germany too that you shouldn’t miss: the Romantic Road. Stretching for 220 miles, the Romantic Road leads travelers through stunning Bavaria. A land of fairytale-like castles, amazing scenery and medieval towns, there is so much to see and do on the route. Plan to spend at least a week (longer if possible) traveling between Wurzburg and Fussen and start your own romance with southern Germany. The Romantic Road starts in Wurzburg, a charming city with a long history. It was once home to the important Prince-Bishops. The area is also known for its excellent wineries. Visit the magnificent UNESCO-listed Wurzburg Residence, often said to be one of the grandest Baroque palaces in all of Europe. There are several historic churches to admire too, including the colorful Kappele, as well as the atmospheric castle of Festung Marienberg. Bad Mergentheim is a spa town with plenty of historic architecture. The charming market square is well worth a stroll. Journey back to the middle ages at the grand castle of Deutschordensschloss. See the striking artwork in Stuppach Church and Marienkirche. The ornate Weikersheim Castle was formerly a royal home. Today’s guests can appreciate the opulence of the Great Hall and other rooms before strolling through the pretty gardens. The gardens have an arrange grove an many interesting statues. The old town of Rothenburg ob der Tauber is perfect for shutterbugs, with plenty of eye-catching buildings. The striking medieval constructions include the old town hall, homes, the old smithy, a monastery and several churches. Other places of interest include Toppler Castle, the remains of the town wall and the Altes Brauhaus. It is often said to be one of the most picturesque towns on the Romantic Road. There are diverse museums too, including the Craft House, Imperial Museum and Doll and Toy Museum. You can experience Christmas all year round at the Christmas Museum. Dinkelsbuhl has a similar vibe to Rothenburg o.d. Tauber, but without the crowds. It is surrounded by a historic defensive wall, with grand towers rising up allowing people to keep watch over the surrounding areas. It’s a terrific place to see what Germany looked like in times gone by. Learn more about the area’s past at the Museum of History and the historic Deutsches Haus. Stroll the quaint streets and admire buildings like St. George’s Minster and St. Paul’s Church. Nordlingen is another scenic town on the Romantic Road that still has its medieval walls intact. Gaze up at the toering steeple of St. George’s Church, visit the tanner’s quarter and see the former hospital of Spital. Local museums include the Bavarian Raiway Museum, the Ries Crater Museum and Stadtmauermuseum. Donauworth is situated at the point where the Danube and Wornitz Rivers meet. It’s a great base for hiking in surrounding areas. A visit to the Kathe-Kruse-Puppen-Museum is a highlight for many, with detailed dolls and puppets proudly on display. The Monastery of the Holy Cross and lovely Reichstrasse are other top local attractions. Augsburg is one of the oldest cities in all of Germany. It was also once one of the richest communities in the medieval era. Today, it is the biggest city on the Romantic Road. It boasts a wealth of attractions and activities, including Mozart’s birthplace, the old town hall, the Roman Museum and Fugger Stadtpalast. You can also see the world’s oldest social housing at the Fuggerei. A few people still occupy the welfare housing today. Sitting on the banks of the Lech River, you can admire scenic river views aplenty. The colorful buildings of the old town add to the beautiful views. 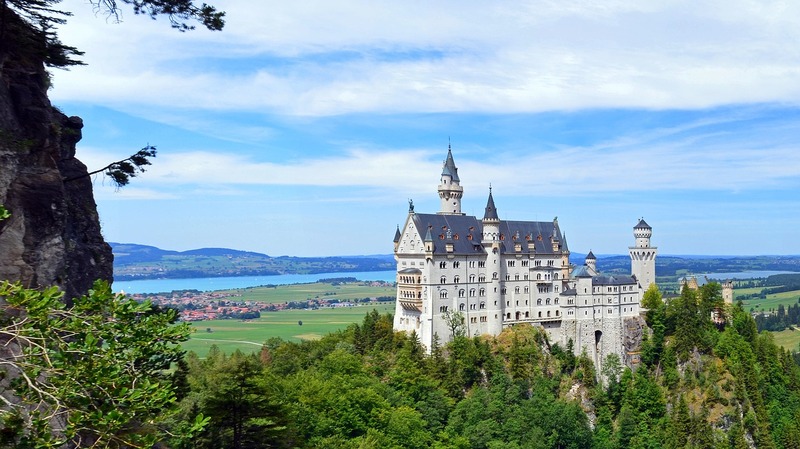 The jewel at the end of the Romantic Road is the splendid Neuschwanstein Castle. Dating back to the late 1800s, it occupies a prime hilltop location. Greenery surrounds the magical castle, which was the inspiration behind the iconic Sleeping Beauty Castle created by Disney. Turrets and towers rise from the grand walls, and the interiors are equally as impressive. Brown signs conveniently mark the route, helping you to keep on track. There are many places to eat, drink and sleep along the Romantic Road and road conditions are generally very good. There’s more to Germany than it’s capital of Berlin! Grab some friends, secure your luggage with a strap from Vault Cargo, make sure your vehicle is in tip-top condition and be wowed by the beauty of Germany.